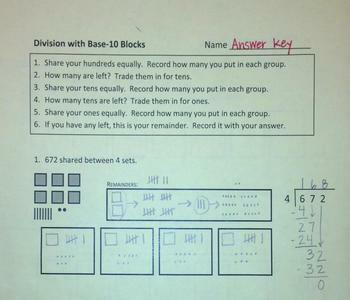 This lesson worksheet helps demonstrate that division is splitting up or distributing a group into smaller groups that are equal. The steps of splitting up, taking the leftovers and trading them in, and counting what is leftover match the steps of long division so that students can see WHY we divide, multiply, subtract, and bring down. 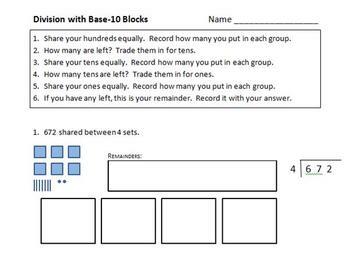 In my class, we spend an entire day or two using JUST MODELS, then when we transition to the long division steps on paper and I refer back to the worksheet and our pictures.